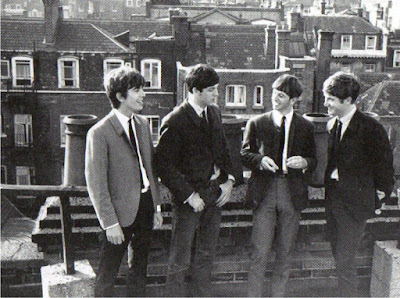 Meet the Beatles for Real: "Maybe some day we will do a concert up on a rooftop..."
"Maybe some day we will do a concert up on a rooftop..."
Anyone know Where & When? On the roof of Washington Hotel 63 Ive found so far. I know there is one in Bournemouth but is there more...? July 27, 1963. At the rooftop of Royal Pier Hotel in Weston-Super-Mare. Waiting to shoot a series of photos to advertise Ty-Phoo tea. Each Beatle is seen attempting to spell out the letters of the product's name, and jumping from a staircase railing.